If you’ve been looking for a way to create ePub documents that you can read in iBooks on your iPad or iPhone, then you’re in luck. Apple on Thursday released iWork 9.0.4, an update to its suite of productivity software; chief among the improvements is the ability for Pages to export ePub files. 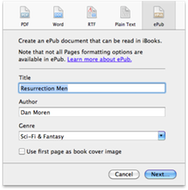 Exporting in ePub is, at first blush, a simple affair: just choose Export from Pages’s File menu and click the ePub icon that’s joined the existing PDF, Word, RTF, and Plain Text options. You’ll be asked to specify a title, author, and genre (which you can pick from a list or specify your own), as well as being given the option to use the first page as a cover page. However, ensuring that the ePub file looks its best is a little more challenging, as I found when I ran a test export without altering my test document: my paragraphs lost their indentation and all my chapter divisions were ignored. Fortunately, Apple offers a sample document on its Website (ZIP file) which you can use as a template for creating ePubs; alternatively, you can import the styles from the sample into your own document. As it turns out, Pages uses paragraph styles to figure out what to include in the ePub’s table of contents; you can specify which styles to use by opening the Document Inspector, clicking on the TOC tab, and choosing any relevant styles. Apple also provides an entire knowledge base document on using the ePub export capabilities of Pages, including when to use it versus exporting in the PDF format. The company notes that those documents created using Pages’s page layout templates can’t be exported into ePub, and that ePub files will often look quite different than the native Pages file. Once you’ve exported the document, you’ll want to see how it looks. Unfortunately, just because Pages can export into ePub doesn’t mean it can read or display those documents. If you want to check out your book, you’ll have to transfer it to your iPhone, iPad, or iPod touch and read it in iBooks. Just drag the exported document from where you saved it, drop it onto iTunes, and sync your device; it should then appear in your iBooks shelf. While Pages’s ePub export is arguably the most significant addition of iWork 9.0.4, there are a handful of other improvements in the update. Pages, Numbers, and Keynote all get a fix for an unspecified issue with tables, and Keynote also gets fixes for a problem when printing handouts with rule lines, an issue with the slide switcher, and a problem when automatically resizing some images while changing slide size. iWork 9.0.4 weighs in at 63.44MB and is available via Software Update and Apple’s support downloads site. It’s recommended for all users of iWork 9.0 and up.